Looks so real, packaged fresh from the Undertakers Lab! Almost like the one at your local Grocery Store... with bloody red edges where this poor unsuspecting victim hand was unexpectedly severed! Keep the Halloween holiday alive by pretending to serve your guests a freshly cooked horror hand from the Chop Shop, or toss around your mad scientist lab or haunted graveyard cemetery. This hand is the gift that keeps on giving. Laid on the pavement underneath the tire treads of a parked car? Oh yeah. Sticking out from a closed door? Check. Is that a person crawling out of the toilet!? You bet it is! I think you'll find that this product will be just the ticket for any hair-brained shenanigans you're dreaming up. 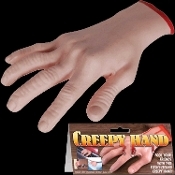 Hollow soft rubbery molded pvc plastic flesh-tone hand measures approx. 8-inch (20cm) Long x 5-inch (12.5cm) Wide x 1.75-inch (4.38cm) Deep.